Tsvetan Tsvetanov, Deputy Chairman of the ruling party Citizens for European Development of Bulgaria (GERB), leader of GERB’s parliamentary group and former Interior Minister had known of a serious case related to the construction company Arteks Engineering and had initiated an investigation against them. Four days later, he acquired a luxury apartment in the “Letera” building on 8 “Latinka” Street, which prior to that belonged to the owners of Arteks – Plamen Miryanov and Vessela Miryanova. Thus, the initiator of the probe and the subjects of the probe swapped some properties and the probe and its outcomes mysteriously disappeared. On June 8, 2018, as Chairman of the Parliamentary Committee on Home Affairs, Tsvetan Tsvetanov sent a letter to the Mayor of Sofia Yordanka Fandakova requesting from her to check the “Zlatev Vek” (Golden Age) high-rise that Arteks Engineering had been building on “Zlaten Rog” Street and to send him a report with the results. On June 12, he made the deal with the Miryanov family. The probe was requested on a signal from the district of “Lozenets” Initiative Committee, which for years had been fighting against the 120-meter high building that had been erected in their neighborhood. In a video, dated May 2, 2018, the Chief Architect of Sofia Zdravko Zdravkov speaks to fact that the case is serious and there are dynamic behind-the-scenes actions around this project. “The text messages I have received from the Miryanov family, I can show them to you… I am convinced that this conversation and the negotiations we are conducting are extremely difficult and unpleasant because behind every square meter there is a huge financial interest,” he said. The video is from a public meeting with local residents and the full version can be viewed on Actualno.com. Zdravkov also stated that meetings with the Miryanov family had been held in Fandakova’s office and a reduction of the height of the building on “Zlaten Rog” Street had been negotiated. In the end, there has been such a reduction from 120 meters to 98 meters, as is the neighboring Hotel “Marinella”. 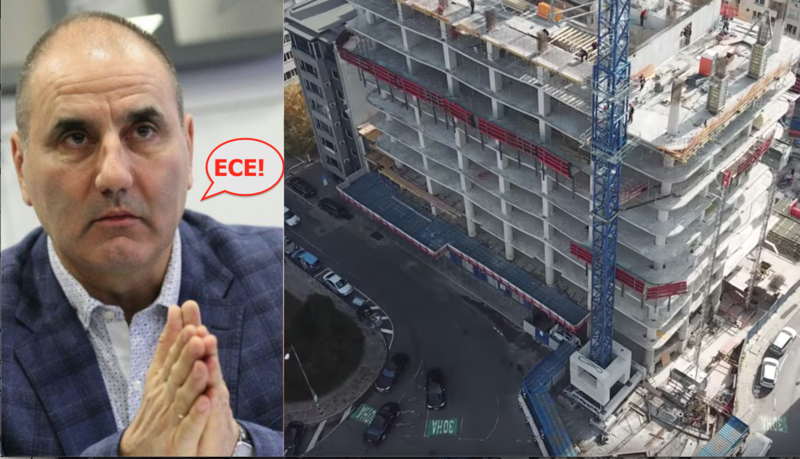 The “ApartmentGate” scandal began with a publication of Free Europe and the Anti-Corruption Fund from Tuesday, March 19, which announced that Tsvetan Tsvetanov has acquired a luxury apartment with a private VIP elevator and a separate two-car garage at the price of EUR 630 per square meter. The upscale apartment has been swapped with Arteks against two other apartments owned by Tsvetanov and an additional payment of BGN 100,000 or a total BGN 387, 438.8. This price is four times lower than the market prices in this area. A check by Bivol showed that on the same day – June 12, 2018, the two apartments were resold by Arteks to the former GERB IT expert and member of GERB’s election campaign management, Simeon Velkov, who paid for the two units on “Elemag” Street BGN 470,000. There are some explanations for these strange property favors with at least one clear beneficiary – Tsvetan Tsvetanov. One of them is esoteric. According to Arteks owner Vessela Miryanova, Tsvetanov had been given a preferential price because he liked the architecture and most of all appreciated the “protection energy” of the building on “Letera” Street provided by the built in it “Psalm 91”. However, there is another explanation and it is that after Tsvetanov had pressed Fandakova to probe the Miryanov family, they urgently sought an extra-institutional solution to their problems and found it in this deal. Blackmail, favoritism, or both, but in such a deal there is no way there had not been a hidden price, sums it up Capital in an article that reminds of the complex relationship between Arteks and the local government in Sofia, which is controlled by GERB. According to the “Lozenets” Initiative Committee, the explanation is that there is a government cover-up for the Miryanov family. Ever since the end of 2017, the Committee has been warning that Arteks Engineering is building a high-rise on 10 “Zlaten Rog” Street with an expired building permit. Here is the place to remind that the problematic building had been granted permission for construction at the time when the current Prime Minister and leader of GERB, Boyko Borisov, was Mayor of Sofia. The project was approved at the last moment immediately prior to the entry into force of the Sofia Master Plan, which limits construction in this part of Sofia to 28 meters. Builders, however, had been in no hurry to begin the large-scale construction of the 34-story building. The first permit expired in 2012 and has not been renewed until 2017. The second one, which cannot be renewed under the then-law, expired in November 2017, but the high-rise was not complete. Parliament came to the rescue by amending the law. With the amendments, the deadline for completing such projects was extended to ten years from “starting the construction of elements of the technical infrastructure”. Free Europe explains that without these amendments, the construction of the “Zlaten Vek” building could not have happened. Tsvetan Tsvetanov and the GERB Parliamentary Group have voted in favor. But even after the amendments to the law, the building remained problematic because they have no retroactive effect. However, the Chief Architect of Sofia and the Directorate for National Construction Control found a loophole, referring to an informal correspondence with Valentin Yovev, Deputy Minister of the Ministry for Regional Development and Public Works (MRDPW). He motivated his opinion on the basis of the amendments made to the Territorial Development Act, taking the surprising legal position that they can be applied retroactively. The Minister of MRDPW, Petya Avramova, later stated that this correspondence has no legal and binding character. Nevertheless, it has produced an effect, and the building is being constructed at a fast pace. The” Lozenets” Initiative Committee has filed several complaints and signals with the Prosecutor’s Office. Among them is the complaint to Parliament’s Committee on Home Affairs, headed by Tsvetanov, which, after his letter to Fandakova, has faded away without a trace. The latest signal by the Committee has been against Deputy Minister Yovev for exceeding his official powers. The Sofia City and Sofia Prosecutor’s Offices cannot decide which one of them is the competent authority to deal with the case. The citizens of Lozenets are not optimistic because the probe on their previous signal has been terminated. Now they want judicial control on the administrative act, giving the green light to the construction of the building. Going back to Chief Architect Zdravkov’s words about the text messages received from Arteks, it is to the Prosecutor’s Office to check whether there had been threats and whether management decisions have been taken as a result of illicit pressure. Obviously, Arteks’ high-rise should be part of this probe, and the request to check it, initiated by Tsvetanov, deserves particular attention because a few days later, the initiator of the probe and the subjects of the probe started a complex property relationship.